Dagger of Spiragos is now available! Artifacts from the fallen titan Spiragos have been recovered, and forces are at work that would see them used for ill. The Dagger of Spiragos and the Ring of Spiragos are now in the player characters’ hands — and they must do what they can to rid Scarn of the foul relics of the titans, whatever the cost! I developed and added additional enhancements to this adventure for Scarred Lands with Scott Holden as acting line developer. This adventure is now available in PDF for two rule sets: Dagger of Spiragos (5E) and Dagger of Spiragos (Pathfinder). Enjoy! 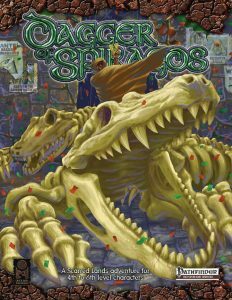 Dagger of Spiragos is a sequel to the free 2014 Gen Con Scarred Lands Special Preview adventure, the Gauntlet of Spiragos (5E) and (Pathfinder) editions. In Gauntlet of Spiragos, the PCs traveled to the legendary Chasm of Flies, where they discovered a tribe of spider-eye goblins who possessed relics of their fallen master, Spiragos. Now, with those items in hand, the PCs travel to the city of Fangsfall, where they must seek aid in destroying the foul objects.